When I was a lot younger, three fermented beverages caught my fancy. The first of course …and still beloved…was beer. Then there was Vino Nobile di Montepulciano …served with coarse bread on the piazza of the tiny walled town that, back in the 1960's, was known only to Tuscans. And there was Charles Krug Vin Rosé . As I remember, this salmon colored wine positively glowed against the snow of Squaw Valley at the end of the day…fresh, fruity, and dry. Of course, back then, when a young man had a “date with promise”…he'd spring for a bottle of Portuguese Rosé—Lancer's or Mateus. Alas, those ceramic bottles most reliably fulfilled the destiny promise of candleholder. (As Kate Wolf sang: It ain't in the wine.) 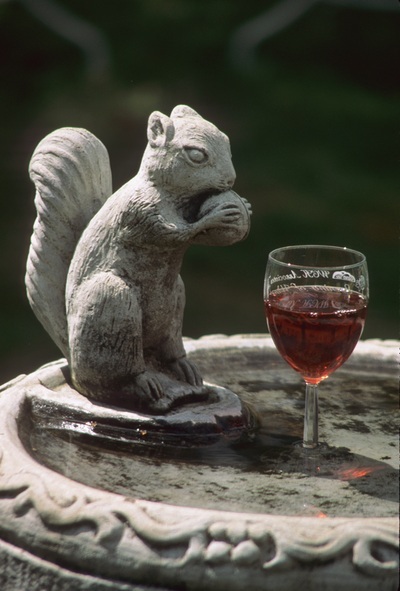 Not long afterwards, however, Rosé wines took a belly flop in consumer esteem. A great deal of mass-produced wine found its way into large jugs of cheap Rosé…relying upon considerable sweetness to cover its flaws. As Californians awakened to wine quality in the 70's and 80's, first Chardonnay, then Cabernet, then Merlot, and finally Pinot Noir became media darlings and for many of us…enduring favorites. However, California Rosé almost disappeared …and certainly could rarely be found in a 750 ml bottle with a cork. Quality Rosé wines are made deliberately, not as an afterthought, and it takes plenty of energy at harvest. Red grapes, typically varieties with modest pigment, are crushed in the usual manner and inoculated with yeast. However, instead of allowing the juice and skins to ferment to dryness over a week or two, the wine is pressed after a couple days. The wine by then has picked up enough color to show more than a “blush,” but not enough to acquire deep the red hues and tannic astringency that would develop with longer skin contact. After pressing, we treat Rosé like white wine in the cellar…usually with scant oak exposure…and bottle it young. Ten years ago, I made a bone dry Rosé of Pinot Noir—against the advice of nearly everybody I asked. “Silly you. Californians won't buy pink wine.” I did it anyway. It was delicious, without a doubt, but my advisors were right about the image challenge. However, we have now entered a new century, and many talented California winemakers have rediscovered Rosé, and this is fabulous news for dancers, lancers, and lovers…and cooks. 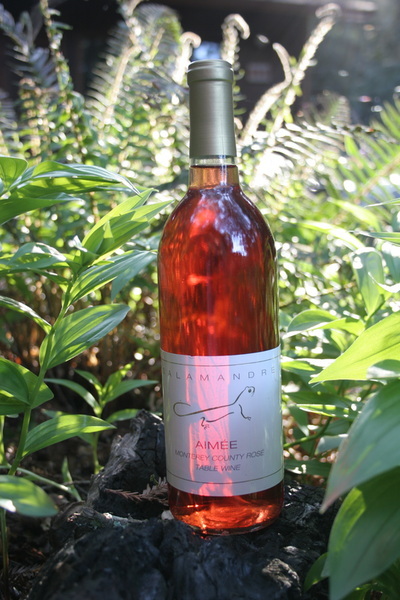 Salamandre is delighted to release Aimée —a Rosé made with Pinot Noir and bit of Chardonnay, just in time for the picnics and sunsets that await as our days grow longer.